The UN Security Council selected, unelected but anointed Libyan government in Tripoli (the GNA) rejects the elected parliament in Tobruk’s decision announced by Field Marshall Haftar, to now keep funds of oil sales and not send such funds to Tripoli, after the victory of Haftar’s Libyan National Army (LNA) in retaking the oil crescent. When will the West stop interfering in Libya? The UN-backed Libyan government warned on Tuesday 26 June that any attempt by the East (Tobruk) to export oil independently will be stopped. “Exports by parallel institutions are illegal and will fail as they have failed in the past,” said the head of Libya’s Tripoli based National Oil Corporation (NOC), Mustafa Sanalla. The officially appointed (by Parliament) of Libyan National Army (LNA) leader, Field Marshal Khalifa Haftar, announced on Monday 25 June that all future revenues from the eastern oil ports which it controls will be handed to the Eastern Government administration in Tobruk/Benghazi after the LNA recaptured from Ibrahim Jadran’s militia in 10 days of deadly fighting with the militia. Jadran himself is said to have fled to Turkey. The Parliament, based in East Libya made a similar attempt to bypass Tripoli in April 2016 but their planned sale of 300,000 barrels per day of crude was stopped by the UN Security Council! “UN Security Council resolutions are very clear – oil facilities, production and exports must remain under the exclusive control of (Tripoli-based) NOC and the sole oversight of the (internationally- recognised) Government of National Accord (GNA),” Mustafa Sanalla said. Many UN Security Council resolutions are wrong, and as far as Libyans are concerned, the UN is showing extreme bias in favor of extremists and the Muslim Brotherhood in Tripoli. The perception by many Libyans is that the UN is as corrupt as the now infamous Clinton Foundation, which allegedly secretly facilitated in February 2011, an oil broker to make tens of millions of dollars for themselves and for the Clinton Foundation – patently improper if not a direct conflict of interest for the former Secretary of State, Hillary Clinton, should the rumours and allegations be proven true. The Tripoli based NOC warned it would sue any international company that tries to buy oil from the eastern authorities and that no purchase contract signed with them would be honoured. “There is only one legitimate NOC, recognised by the international community and OPEC,” Sanalla said, in reference to a rival NOC set up in the main eastern city of Benghazi. Haftar took the surprise decision to hand control of the eastern export terminals to the Benghazi-based NOC instead of the internationally recognised Tripoli based state oil firm after his forces suffered heavy losses fighting to recapture the oil crescent. Haftar’s forces, took control of the Ras Lanuf and Al-Sidra terminals on June 14 and more recently took the Brega terminal. Haftar’s decision on Monday 25th June dealt a major blow to international efforts to preserve Libya’s unity through their Tripoli-based UN creation, the GNA. Haftar has full backing from neighboring Egypt, the United Arab Emirates and Russia. 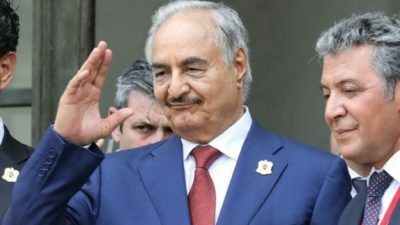 Haftar is showing his other face, that of a leader who may have failed to impose himself as a political or military reality outside of Cyrenaica (East Libya) nevertheless explicitly saying now for the first time he wants to break the centralised oil revenue scheme in Tripoli. The NOC chief called on Haftar to reverse his decision for the sake of unity. “The LNA leadership has missed an excellent opportunity to act in the national interest,” Sanalla stated. Libya’s economy relies heavily on oil, with production at 1.6 million barrels per day under Ghaddafi. The NATO sponsored and inspired uprising of 2011 saw production fall to about 20 percent of that level, before recovering to more than one million barrels per day by the end of 2017. The fighting between Jadran’s militias and the LNA pushed NOC to suspend – without saying how they will physically do so – exports from the eastern oil terminals. “To maintain his reputation as Libya’s only savior, Haftar is now more likely to make dramatic moves against declared enemies….” added Jalel Harchaoui a Ph.D candidate in Geopolitics at Paris University. On the migrants issue it is interesting to note that Malta has stopped migrant NGO boats docking there for good. Some EU Leaders are finally waking up. Malta and Italy are the first! On Friday 29th June also Field Marshall Haftar announced all extremists have been eradicated by the Libyan National Army (LNA) from Derna, hitherto a long held terrorist stronghold. Haftar has also made it clear to all who know him that he absolutely refuses to accept either Serraj or the GNA to have any participation in a new Libya. This announcement comes as France’s Foreign Minister Le Drian’s is about to visit Cairo. It should be remembered that Egyptian officials have not hidden their skepticism about “French aggressiveness in Libya”. In mid-June, the Egyptian Air Force, carried out some of the airstrikes to help Haftar’Libyan National Army (LNA) to retake the terminals of the oil crescent. The UK, French, Italian and US governments on the 27th June issued a joint statement on Libya. It starts “The international community will hold those who undermine Libya’s peace, security, and stability to account”. A huge arrogant mistake, one of a numerous number made by the UN over the years. Well most Libyans response to that, particular in East Libya, is “bugger off”. Just after US-France-Italy-UK joint statement, France took a solo initiative by sending its Ambassadress to Libya, Brigitte Curmi, with a high-level delegation, to the LNA HQ to reason with Haftar and “to discuss regional and international developments”. Though no information was publicly leaked, reliable sources report that Haftar was emphatic. No Serraj; no GNA; no Muslim Brotherhood. No former terrorists can be involved in a new Libya. Full stop. Alistair Burt, Minister of State for the Middle East at the Foreign and Commonwealth Office as well as being Minister of State at the Department for International Development, visited Tripoli in early April, inevitably meeting only the extremists and the UN ‘Vichy’ created GNA Government of so called UN appointed Prime Minister Faez Serraj. Its important to underscore the delusional description on the UK FCO website, that his visit described future opportunities for British companies to do business in Libya. The Rt. Hon. Alister Burt stated what tremendous potential Britain could expect in future from Libya, a joke for many reasons, too numerous to explain. An insane vision of the future of Libyan-Anglo relationship held by totally unrealistic politicians, bureaucrats and British businessmen who do not even understand the degree of hatred of most Libyan people towards Britain above all other Western countries – pure self delusional insanity; certainly taking the UK’s approach to Libya from the sublime to the ridiculous. To talk today of trade with Libya at this time is quite simply farcical. So with this in mind its not difficult to digest the latest news from the incompetent lame duck British Prime Minister who announced on the 27 June that she has approved the appointment of Sir Henry Bellingham as ‘Trade Envoy to Libya’. Richard Galustian is a frequent contributor to Global Research.